“Dico che Questi Indiani del Paraguay non Son Neofiti” Ibáñez de Echavarri, Bernardo. Regno gesuitico del Paraguay dimostrato co' documenti piu classici de' medesimi padri della compagnia, i quali confessano, e mostrano ad evidenza la regia sovranità del r.p. generale con independenza, e con odio verso la Spagna. Anno 1760. In Lisbona: Nella Stamperia Reale, 1770. 4to (20.5 cm; 8"). xix, , 167,  pp. Click the images for enlargements.  Translation of “Parte primera: El reyno jesuitico del Paraguay,” originally published in vol. IV of the Coleccion general de documentos (Madrid: Imprenta real de la Gaceta, 1768–70). It is a vitriolic anti-Jesuit diatribe by a man who had been expelled from the Society of Jesus, not once, but twice! A definite “other side of the coin” from Father Lozano's account of the Jesuits in Paraguay, and originally written in Spanish, Ibanez's work proved popular and by 1774 had appeared in German, French, and this Italian translation. Of course, at that time the Jesuits were hot news, having been expelled in 1767 from the Spanish empire and made to find refuge in Italy and elsewhere. Some copies have a frontispiece but not this one. Of the nine copies we trace to U.S. libraries, we know that at least two lack the frontispiece, but others may also. We have checked the OPAC records for the other seven but because all seven are clearly copy cataloguing we have to wonder about their accuracy. Binding: 20th-century half dark green crushed morocco with marbled paper sides in a swirl pattern and top edge gilt, signed “Alfred Farez” who was active 1909 to ca. 1930. Unidentified owner's gilt monogram at base of spine. Binding signed “Alfred Farez” who was active 1909 to ca. 1930. For BOOKS IN ITALIAN, click here. For more of NATIVE AMERICAN interest, click here. For SOUTH AMERICANA, click here. Establishment, YES! Ibbetson, James. A plea for the subscription of the clergy to the thirty-nine Articles of Religion. London: B. White, James Fletcher, and J. Fletcher & Co., 1767. 8vo (21 cm, 8.3"). , 48 pp. Click the image for an enlargement. Uncommon: A search of OCLC and ESTC locates only two U.S. holdings. A MANUSCRIPT Epitome of the Laws Relating to Indians in Spanish America (Indians, South America). Manuscript on paper. In Spanish. “Resumen de d[e]r[ech]os tocantes a los Yndios, sobre su reduccion. [Spanish America, most likely the Viceroyalty of Peru]: ca. 1725. Small 4to (21.5 cm; 8.5"). ff. (3 ff. blank).  Because Spanish colonial-era laws concerning Indians were numerous and published in the unwieldy Recopilacion de leyes de los reynos de Indias (5 vols., 1681 with subsequent revisions and editions) and authoritatively interpreted in Solorzano Pereira's also hefty Politica indiana (2 vols., 1648 and later editions), lawyers and judges often resorted to reducing the laws most relevant to their own work to a manuscript epitome, i.e., a booklet offering an abstract of each chosen law with its proper citation to either the Recopilacion or to Politica indiana when the full law or interpretation might be wanted. THIS IS JUST SUCH A WORKING EPITOME, and that it speaks both to laws relating to Indians generally and, as per its title, to laws relating specifically to Indians settled in reducciones helps to localize it. In regions where the indigenous populations were sedentary (e.g., Mexico, Guatemala, central Peru) there was no need to force them into “reducciones” (essentially, created communities with a high degree of “townness”); but in places were the natives were nomadic (e.g., Paraguay, and some jungle regions of the Viceroyalty of Peru) enforced resettlement was the norm. Whether the Indians within the ken of this law practice were sedentary by tradition or “resettled,” they were to enjoy numerous privileges and exemptions and also were prohibited from doing certain things. The first chapter headings here are a good summary of these privileges, exemptions, and prohibitions: “On the treatment of Indians,” “Personal service,” “Privileges in legal matters,” and “On criminal behavior.” A second section of the manuscript, in a different hand, offers chapters titled “On the service of Indians,” “On the privileges that the Indians enjoy because of their status as miserables [i.e., a Roman law term for certain categories of individuals],” “On conducting legal proceedings against Indians,” and “Other privileges granted to the Indians.” The many dozens of laws recited here sketch the legal parameters of Indian life under Spain: the requirement of fixed addresses, the ban on white and black residents in the Indian reducciones, bans on polygamy and wine, whippings for those who move to another settlement without permission, and more. We assign the manuscript's place of composition to the viceroyalty of Peru because in the period to 1776 it included regions were there were reducciones, whereas there were none in the viceroyalty of Mexico. For our MSS in SPANISH, click here. For EUROPEAN (Heritage!) LAW, click here. Or for MINING, click here. & for a bit more AGRICULTURE, click here. Death of a Grand Inquisitor (Inquisition). Solemnes exequias celebradas en la Santa Iglesia de Salamanca y Real Seminario de San Carlos en la translacion del cadaver del excmo. sr. don Felipe Bertran, obispo de Salmanca, inquisidor general caballero prelado gran cruz de la real y distinguida orden española de Carlos III. Mexico: Imp. del Br. Don Joseph Fernandez Jauregui, 1791. 4to (20.5 cm; 8.135"). ff., xlvi, xxvi pp.,  ff.  Sole Mexican edition of the official account of the funeral and ceremonies on the death of Bishop Felipe Bertran, the Inquisitor General of Spain. WorldCat locates only six U.S. libraries reporting ownership. MEXICO is one of our great specialties. For our MEXICANA, click here. For more RELIGION, click here. For more INQUISITION material, click here. No More Betting the Estate on the Outcome of a Tennis Match Ireland. Laws, statutes, etc. Acts and statutes made in a Parliament begun at Dublin the twenty first day of September, anno Dom. 1703. In the second year of the reign of ... Queen Anne ... and continued ... to the twenty third of June, 1707 ... And further continued ... until the twelth [sic] of July, 1711, being the sixth session of this present Parliament. Dublin: Printed by Andrew Crooke, 1711. Folio (29 cm; 11.5"). , 8, , 9–16, , 17–20, , 2–28, , 29–38, , 39–41, , 42–45, , 45–54 [i.e., 53], [1 (blank)] pp.  A scarce assemblage of acts, including granting the Queen “additional duty on beer, ale, strong waters,” and other things. Other legislation seeks to curb frauds “committed by tennants”; prevent “ingrossing, forestalling, and regrating of coals imported into this kingdom”; better prevent “excessive and deceitful gaming”; suppress lotteries; and regulate sheriffs and sheriffs' clerks. Printed largely in black letter and each act preceded by its own title-page. For BRITISH-AMERICAN LAW, click here. For more of IRISH interest, click here. FINANCE / ECONOMICS, click here. For BLACK LETTER, click here. Ireland, Samuel. Picturesque views on the river Thames, from its source in Glocestershire to the Nore; with observations on the public buildings and other works of art in its vicinity. London: T. & J. Egerton, 1792. 4to (25 cm, 9.8"). 2 vols. I: Add. engr. t.-p., xvi, 209,  pp. ; 1 map, 27 plts., illus. II: Add. engr. t.-p., viii (incl. t.-p.), 258,  pp. ; 1 map, 25 plts., illus. 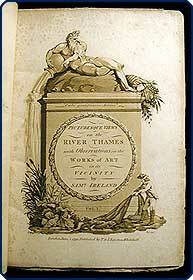  First edition of Ireland’s guidebook to the architectural, botanical, artistic, and historical pleasures to be found along the Thames, featuring assorted poetical digressions as well as descriptions of the splendor of Blenheim Castle and other castles and manors, the disrepair of London Bridge, and paintings by Rubens and Holbein. The two volumes are copiously illustrated with 52 aquatint plates engraved by C. Apostool after drawings by Ireland, 2 maps, and a number of in-text cuts. For more ARCHITECTURE, click here. For some GARDENING BOOKS, click here. Or for ILLUSTRATED BOOKS, click here. Excoriating Fréron the Destroyer Isnard, Maximin. Isnard a Fréron. 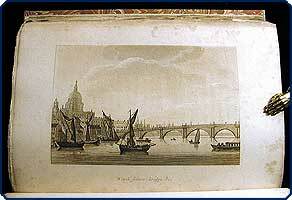 Paris: L'Imprimerie de Du Pont, IV [i.e., 1795/96]. 8vo (19.3 cm, 7.6"). 28 pp.  First edition of this polemic against the infamously vicious journalist and agent of the Reign of Terror, Louis-Marie Stanislas Fréron (1754–1802). Prompted by accusations Fréron had made against him, Isnard (1755–1825), a prominent Girondist who became President of the National Convention in 1793, here decries Fréron's many atrocities in southern France, which included the demolition of a large number of Marseilles's most beloved edifices — but most particularly the massacre at Toulon. The pamphlet is rather nicely printed, with an engraved title-page vignette, one headpiece, and footnotes set in small but neat and attractive type. WorldCat and NUC Pre-1956 locate only eight U.S. institutional holdings. For BOOKS IN FRENCH, click here. Economic Development through Better Roads — CUBA, 1795 Jáuregui, Juan Tomás de. Memoria sobre proporcionar arbitrios para la construcción de caminos en esta jurisdicción. En La Havana: en la imprenta de Estevan Bolona, 1795. 4to (25 cm; 10"). 12 pp.  Jáuregui (d. 1809) was the “primer consul del Real Tribunal del Consulado” in Cuba, and it was the Consulado's “Junta de Gobierno” that ordered this report published — although his was the minority report. At the crown's urging, such Consulados had been created throughout the Empire to aim at economic development and commercial improvement of the various regions of the New World under Spanish control, in good Enlightenment fashion. Public works and land use are traditionally fraught with concern and intransigence on the part of the various parties involved, and in the Cuban case at hand, this was certainly so; the Junta had appointed a four-member committee “para meditar los arbitrios que conceptuasen mas oportunos y menos gravosos para la formacin de caminos” (“to decide the tax rates that will be least burdensome but still will bring about the most timely creation of [good] roads”). Jáuregui's opinion was clearly and concisely expressed and shows a progressive tax structure differentiating users of the roads and the wear each category was most likely to create. Handsomely printed on extremely good quality paper. Searches of NUC, WorldCat, COPAC, CCPB, and the OPACs of the national libraries of Mexico and Spain locate only three copies: two in the U.S. and one in Chile. One of the U.S. copies is incomplete. How many copies may be in Cuban libraries is unknown. Model Moral “LIVES” for “Little Masters & Misses” [Johnson, Richard]. The juvenile biographer; containing the lives of little masters and misses, including a variety of good and bad characters. 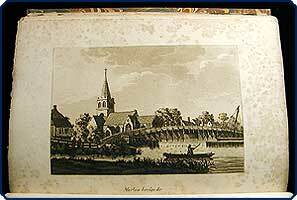 Worcester: Printed by Isaiah Thomas, & sold at his book store, sold also by E. Battelle, Boston, 1787. 16mo (9.5 cm, 3.75"). Frontis. [ii], t-p.[iii], [iv], v–viii, , 10–119, [120 (blank)], [121–24 (adv. )], [2 (blank)] pp. (lacks initial blank f.); illus.  First American edition. In addition to the fictitious biographies (e.g., Miss Betsey Allgood, Master Billy Bad-enough, Miss Nancy Careful, Master Billy Bashful) written to teach morals and conduct, this work contains “Some account of the little author, written by himself” and a portrait of that same “author” on front pastedown. In the text are 20 woodcuts, as well as tailpieces and ornamental rules. Provenance: From the children's book collection of Albert A. Howard, small booklabel (“AHA”) at rear. For CHILDREN'S BOOKS, many ILLUSTRATED, click here. For ILLUSTRATED BOOKS, click here. For CONDUCT Books, click here. Defending the Doctrine of the Trinity — in WELSH Jones, William. Yr athrawiaeth Gatholig o Ddrindod, gwedi ei phrofi trwy ragor nâ chant o resymmau byrr ac eglur, pa rai a draethir yng ngeiriau’r ysgrythur lan, a’i chydmaru mewn dull hollol newydd: ... Gan William Jones, ... Newydd ei gyfiethu o’r chweched argraphiad Saesoneg, i’r Gymraeg, ac mewn rhyw fesur wedi ei dalfyrru, gan J. Williams. Trefecca: Argraphwyd yn y flwyddyn, 1794. 12mo (18.5 cm; 7.25"). 96 pp.  First edition in Welsh of The Catholic doctrine of a Trinity proved by above an hundred short and clear arguments. The true first edition appeared at Oxford in 1756; the author (William Jones, M.A., F.R.S.) was “Rector of Paston, in Northamptonshire, and Minister of Nayland, in Suffolk.” The work is divided into four main sections: 1. The Divinity of Christ. 2. The Divinity of the Holy Ghost. 3. The Plurality of Persons. 4. The Trinity in Unity. Jones also here delivers “a few Reflections, occasionally interspersed, upon some of the Arian Writers, particularly Dr. S. Clarke: To which is added, A letter to the common people, in Answer to some Popular Arguments against The Trinity” (from the English-language title). NUC, WorldCat, and ESTC find only one U.S. library reporting ownership (Harvard). For WALES / WELSH, click here. Early 18th-Century Jonson Collection — At End, a Most AMBITIOUS Catalogue Jonson, Ben. [The three celebrated plays of that excellent poet Ben Johnson]. London: Pr. for J. Walthoe, G. Conyers, J. Knapton, et al., 1732. 12mo (16.8 cm, 6.6"). Frontis., 96, 96, 100, 35,  pp., without the general title-page.  Volpone, The Alchemist, and Epicoene: Or, the Silent Woman: Three of Jonson's most popular and enduring comedies, happily followed by “A True and Exact Catalogue of All the Plays and Other Dramatick Pieces, That Were Ever Yet Printed in the English Tongue, in Alphabetical Order.” The plays were also issued separately; and while the title-page giving “The Three Celebrated Plays of That Excellent Poet Ben Jonson,” published by W. Feales, is not present here, the presence of the Volpone plate (engraved by Jan Van der Gucht) and several pagination errata seem to indicate that this is indeed Feales's omnibus edition. Binding: Contemporary speckled calf framed and panelled in blind with roll-bordered panel in plain calf, blind-tooled corner fleurons. The Check Is in the Mail Joseph Anthony & Co. Autograph Letter Signed to Benjamin Bourne. Philadelphia, PA: 28 January 1800. 4to (10" x 7.75"). 1 p., without the integral address leaf.  The merchant company of Joseph Anthony & Co. tells Bourne that on 18 January it sent him a post note for $170; it laments the irregularity of post mail, which is due (it thinks) to carelessness of the post riders. Provenance: Ex–Allyn K. Ford Collection, Minnesota Historical Society, recently deaccessioned. For PRE-1820 AMERICANA, click here. For more of PHILADELPHIA interest, click here. Good Works — Greek & Latin — A Very Large & Handsome Folio Justin, Martyr, Saint. [in Greek, transliterated as] Tou en Hagiois Patros Hemon Ioustinou philosophou kai Martyros Ta heuriskomena panta, [then in roman] S.P.N. Justini philosophi et martyris opera quæ exstant [sic] omnia. Paris: Sumptibus Carolii Osmont, 1742. Large folio (42.6 cm, 16.75"). ff., cxxviii, 657 [i.e., 653],  pp.  Principal edition of the collected works of Saint Justin Martyr (ca. 100–165), “much the greatest figure” of Christian apologists since the Apostles (NCE). The first Latin translation of his works did not appear until 1554. This is the authoritative edition edited by Prudent Maran (1683–1762), who reordered the works so that Justin's Dialogue with Trypho follows his two apologies, according to the original sequence. Only these three documents, which survive in later manuscripts, are surely his; however many other works are attributed to Justin. The present text contains the Dialogue, Apology I–II, and more, with biographical documents appended. The text, in Latin and Greek, is divided into two sections: a preface in 15 short chapters, and the main text. The former is printed in roman and italic with nice woodcut head- and tailpieces, and one historiated woodcut initial. Sidenotes, footnotes, and woodcut ornaments like those in the former section enhance the main text, which is printed double column in parallel Latin and Greek, with two handsome engraved initials on the first page below a finely engraved vignette by J. B. Guélard (fl. ca. 1730) after a drawing by A. Humblot (fl. ca. 1740). The title-page, printed in red and black, has an engraved device by [Nicolas-Jean-Baptiste] de Poilly (1707–80). This copy also has a half-title page. For CATHOLICA in particular, click here. Keate, George. Netley Abbey. An elegy...the second edition, corrected and enlarged. 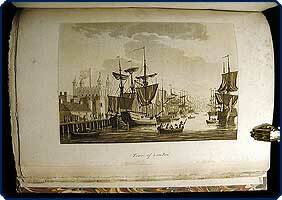 London: J. Dodsley, 1769. 4to ( 26.4 cm, 10.4"). 31, [1 (blank)] pp. (lacking the half-title).  Originally published in 1764 under the title Ruins of Netley Abbey (and a different item from the anonymously printed Ruins of Netley Abbey of 1765), this poem features an engraved vignette of the titular ruins, done by C. Grignion, on the title-page; also present is a brief history of the abbey. For more ENGLISH LITERATURE, click here. Life in a Conceptionist Mexican Convent Ladrón de Guevara, Baltasar. Manifiesto, que el real convento de religiosas de Jesus Maria de Mexico, de el real patronato, sujeto a el orden de la purissima e immaculada concepcion, hace a el sagrado concilio provincial ... [Mexico City]: En la Imprenta de D. Felipe de Zuñiga y Ontiveros, 1771. Folio (28.9 cm, 11.4"). f., 217,  p.
 Only edition. This official declaration of the Order of the Immaculate Conception of the convent Jesus Maria of Mexico encompasses a historical synopsis of the foundation and progress of that monastery and ten chapters on the the religious life of the sisters — their vow of poverty in history and practice; admission into the monastery; and the necessary approval of the Royal Court to implement reforms, according to the rules set forth by Frai Payo Enriquez de Rivera, O.S.A. (1622–84, appointed Archbishop of Mexico in 1668). The document is addressed to the fourth provincial council, called by Archbishop Lorenzana, and is a plea on behalf of the nuns to not change how things are done and administered in the nunnery, to not introduce innovations. Guatemalan by birth, Guevara (d. 1804) studied civil and canonical jurisprudence at the Tridentine Seminary in Mexico, where he graduated from the university and became a lawyer at the royal court. One of the leading lawyers in Mexico, he ascended quickly to high office, and was appointed governor in absence of the viceroy four times; according to Beristain, he was called the “American Ulpian” (after the Roman jurist) by at least one contemporary. For more of WOMEN's interest, click here. A “Little Manual . . . FIRST Designed for PRIVATE Use” of TWO PRINCESSES Lake, Edward. Officium eucharisticum. A preparatory service to a devout and worthy reception of the Lord's Supper. Dublin: Printed by and for Samuel Fairbrother, 1724. 12mo (14.5 cm; 5.75"). ff., 176 pp.  The last of four editions PRINTED IN IRELAND, all of which are rare and none of which are reported as held in any U.S. library. Overall this is “the 21st. edition corrected and enlarged. To which is added, a meditation for every day in the week.” A wonderful, small, go-with-you work of personal worship. Lake was “chaplain and tutor to the princesses Mary and Anne, daughters of James, duke of York” and originally wrote this “devotional manual . . . for his royal pupils” (ODNB). For SERVICE BOOKS, click here. French Astronomical Ephemerides — TIME & Measuring It Lalande, Joseph Jérôme le Français de. Connoissance des temps, pour l'année bissextile 1768. Paris: De l'Imprimerie Royale, 1766. 12mo (19.7 cm, 7.75"). 280, [4 (contents)] pp. ; 2 fold. plts.  Uncommon and attractively printed French astronomical almanac for the year 1768, published on behalf of the Académie Royale des Sciences and printed at the Royal Press, for the use of both astronomers and navigators. Lalande (1732–1807), one of the most prominent astronomers in France, served as editor of the Connaissance — which has been published continuously under slightly varying titles from 1679 through the present day — from 1760 until 1776 and then again from 1794 until his death. This edition offers, in addition to its numerous tables of data, brief articles on calculating sunrise and sunset, methods for finding the moon's passage over the meridian, various observations to be made in each month, an account of Maraldi's observations of the third satellite of Jupiter, a list of the members of the Académie, etc., and at the back of the work two folding plates: a depiction of the lunar lakes and a map of France engraved by C. Delahaye. This work on time and its measurement, with conversion tables, is not widely held institutionally: a search of WorldCat finds only one reported U.S. location (the Burndy Library at the Huntington). Provenance: From the residue of the stock of the F. Thomas Heller bookselling firm (est. ca. 1928). For MARITIME matters, click here. Getting the Bishop's Position RIGHT La Luzerne, César-Guillaume de. Instruction donnée par M. L'évêque de Langres, aux curés, vicaires et autres ecclésiastiques de son diocèse, qui n'ont pas prêté le serment ordonné par l'Assemblée nationale. Paris: Guerbart, . 8vo (19.5 cm, 7.6"). 38,  pp.  A non-juring cardinal looks at the constitutional oath; the pamphlet closes with “les noms des prélats qui ont adopté la présente instruction.” There is a good deal here on the administration of the sacraments. This is the 40-page variant (Martin and Walter note a 35-page printing), with a warning on the final page regarding pirated, incorrect versions of the piece. not in PRB&M's illustrated catalogues . . . In the Spirit of Peace & Brotherhood Lamourette, Antoine-Adrien. Instruction pastorale de M. L'évêque du département de Rhône et Loire, métropolitain du sud-est, a Mm. les curés, vicaires et fonctionnaires ecclésiastiques de son diocese. Lyon: Amable le Roy, 1791. 8vo (21.3 cm, 8.4"). 24 pp.  Uncut copy of this letter from Lamourette (1742–94), the Constitutional bishop of Rhône-et-Loire, remembered for his proposal of fraternal love as the solution to factionalism in the Assembly. He seems to have favored pastoral letter-writing — there were several Instructions issued in 1791, including one of only 15 pages, and one of 102; the present 24-page example is dated 12 May, and addresses the split between the constitutional and the non-juring clergy. Uncommon: WorldCat and NUC Pre-1956 locate only three U.S. institutional holdings of this particular Instruction. For more BOOKS IN FRENCH, click here. Including the work of Fuseli & Blake Lavater, John Caspar. Essays on physiognomy, designed to promote the knowledge and the love of mankind ... illustrated by more than eight hundred engravings accurately copied; and some duplicates added from originals. London: Printed for John Murray, No. 32, Fleet-Street; H. Hunter, D.D. Charles's-Square; and T. Holloway, No. 11, Bache's-Row, Hoxton, 1789–98. 4to in 2's (34.1 cm, 13.4"). 3 vols. in 5. I:  ff., iv, , 281 pp. (i.e., 285); 15 plates. II, part 1: xii, 238 pp. ; 45 plates. II, part 2:  ff., pp. –444; 47 plates. III, pt. 1: xii, 252 pp. ; 25 plates. III, pt. 2:  ff., pp. 253-437 (i.e., 181 pp. ),  pp. ; 42 plates.  First edition in English of Lavater's study of character based on physical attributes. Originally published in German (Physiognomische Fragmente, 1775–78), these influential Essays were translated into English by Henry Hunter (1741–1802) from the subsequent French edition (La Haye, 1781-87), and published in 41 parts under the direction of Royal Academy artists Henry Fuseli (1741–1825) and Thomas Holloway (1748–1827), who both contributed illustrations. In fact, Lavater (1741–1801), a Swiss priest and poet, had no part in the new publication; Hunter arranged the endeavor with Holloway and publisher John Murray without the consent of the author, who learned of the project after it had gone to press, and objected, fearing a new edition would subtract from sales of the old. These books contain over 360 engraved illustrations in the text and 132 full-page engraved plates, many of which Holloway copied directly from the French edition; it's the multiple images on the full-page plates that produce the proud claim of “more than 800 engravings” on the title-page. They include portraits of famous wrinkled writers, philosophers, musicians, monarchs, statesmen, and Lavater himself; silhouettes of Jesus and portraits of Mary; details of male, female, and animal attributes; and skulls, hairlines, eyes, noses, and mouths, among other features, engraved by Holloway, Fuseli, William Blake (1757–1827), James Neagle (1765–1822), Anker Smith (1759–1819), James Caldwall (1739–ca. 1819), Isaac Taylor (1730–1807), and William Sharp (1749–1824), inter alios, after works of art by Rubens, Van Dyke, Raphael, Fuseli, LeBrun, Daniel Chodowiecki (1726–1801). The commentary on these images makes this a work of art history/criticism, as Lavater is both free and detailed in his notes of how various artists handle details of physiognomy and body language to express character and engender beauty. The first systematic treatise on physiognomy was written by Aristotle. Publications on the subject continued steadily throughout the ages, although the developing study of anatomy in the 17th century detracted interest from what later came to be known as pseudoscience. Lavater's is the only notable treatise in the 18th century, and indeed, “. . . [his] name would be forgotten but for [this] work,” which was very popular in France, Germany, and England (EB). Provenance: Bookplate of Nicholas Power on front pastedown of all five volumes (related to Richard Power, Esq., of Ireland, listed as a subscriber? ); and bookplate of Gordon Abbott on front free endpaper of three volumes, engraved by J.W. Spenceley of Boston in 1905. For more ILLUSTRATED BOOKS, click here. For more TRANSLATIONS, click here. For a little more SCIENCE, click here. For NATURAL HISTORY, click here. For a BIRD book or two, click here. For more MEDICINE, click here. For more SETS, click here. [La Ville, Jean-Ignace de]. Two memorials of the Abbé de la Ville, together with the French king’s declarations, transmitted by the said minister to the States General of the United Provinces; as likewise the answer of their high mightinesses to the said pieces, as contained in their resolution of the 7th of November N.S. 1747. London: E. Owen, 1747. 8vo (21 cm, 8.25"). 70 pp.  First English edition of these documents, printed in French and English on opposing pages. The missives were part of the rather unfriendly negotiations between Louis XV of France and the United Provinces of Netherland during the War of the Austrian Succession; their bearer, the Abbé de la Ville, a churchman and diplomat prominent in the French court, had become a member of the Académie Française in the year prior to this publication. Two Women in the Contents  Womanly Provenance, Too [Law, William]. An extract from a treatise on the spirit of prayer, or the soul rising out of the vanity of time into the riches of eternity. With some thoughts on war. Remarks on the nature and bad effects of the use of spirituous liquors. And considerations on slavery. Philadelphia: Joseph Crukshank, 1780. 12mo (16.3 cm, 6.45"). 84 pp. [bound with] Webb, Elizabeth. A letter...to Anthony William Boehm, with his answer. Philadelphia: Joseph Crukshank, 1783. 44 pp. [with] [Benezet, Anthony]. In the life of the lady Elizabeth Hastings... [Philadelphia: Joseph Crukshank, 1784]. 8 pp.  Law's mystically-inclined meditations sold vigorously in a number of English and American editions; they serve here as the introduction to an interesting selection of Christian inspirational readings from Philadelphia printer Joseph Crukshanksome writers named, and some not. The Considerations on Slavery are designated simply as those of a "number of different authors"; the Remarks on . . . Liquors, which aims to promote health and happiness rather than directly religious concerns, is attributed by ESTC to Anthony Benezet, as is the volume's last piece, the title of which is taken from its opening lines. Lady Elizabeth Hastings was the original for Aspasia in Steele's "Tatler" and a major donor to Oxford University Queen's College. Elizabeth Webb, "an acknowledged minister among the people called Quakers," first encountered Prince George of Denmark's chaplain Boehm while on a visit to Great Britain; the missive with which she opened her subsequent correspondence with him, here, greatly inspired him and a number of his friends. Provenance: With inscription reading "Miss Hannah Amelia Moore / Book a Present from her worthy / Friend Ruth Patton / 1789." For other ABOLITION items, click here. “Le Démon de la Discorde” Le Coz, Claude. Lettre des évêques et prêtres assemblés a Paris en concile national, a leurs frères les évêques et prêtres résidens en France. Paris: L'Imprimerie-Librairie Chrétienne, 1797. 8vo (21 cm, 8.3"). 15,  pp.  First edition, untrimmed copy of this essay on pacification and reconciliation, undersigned by the Constitutional bishop of Rennes and six others. WorldCat and NUC Pre-1956 locate only seven U.S. institutional holdings. People, Obey Your Ministers — Ministers, Do Your Jobs Le Coz, Claude. Seconde lettre synodique du Concile national de France, aux pasteurs et aus fidèles, sur divers abus qui se sont introduits dans quelques paroisses. Paris: De l'Imprimerie-Librairie Chretienne, 1797. 8vo (21.2 cm, 8.4"). , 25,  pp.  First edition, untrimmed copy: the National Council's examination of the church schism as it stood in 1797, and particularly of the question of electing ministers. This letter was issued in the name of Le Coz, Metropolitan bishop of Rennes and president of the Concile National. Uncommon: WorldCat and NUC Pre-1956 locate only three U.S. institutional holdings. A Southerner Calls for ABOLITION in 1767 [Lee, Arthur]. [drop-title] Extract from an address in the Virginia Gazette, of March 19, 1767. [Philadelphia? : Pr. by Joseph Crukshank?, 1780?]. Small 12mo. 4 pp.  "That slavery then is a violation of justice, will plainly appear. . . . Now, as freedom is unquestionably the birth-right of all mankind, Africans as well as Europeans, to keep the former in a state of slavery is a constant violation of that right and therefore of justice." This strong anti-slavery sentiment, addressed to the Virginia Assembly, was first printed outside of the Virginia Gazette in 1767 as an addition to Anthony Benezet's A caution and warning to Great-Britain, and her colonies. Whether it was also issued separately in 1767 is unclear. There were several editions and variants of editions of this work attributed to Arthur Lee on the basis of statements in G.S. Brooke's Friend Anthony Benezet (pp. 301, 332, and 422), and we refer the interested reader to the records of the North American Imprint Project for the decipherment of them. For more PRE-1820 AMERICANA, click here. For HUMAN RIGHTS more generally, click here. Swearing, Loyalty, & Hatred L'église gallicane au clergé de l'église de Paris, ou lettre de plusieurs administrateurs de diocèses, sur la conduite d'une partie des oratoires de Paris, relativement au serment de haine a la royauté & d'attachement a la constitution de l'an 3. Bruxelles: 1797. 8vo (21.3 cm, 8.4"). 47,  pp.  First edition of an angry rebuttal of some reasons given for taking the oath of loyalty imposed after the coup of 18 Fructidor, with the “Regle de conduite des fidèles pendant la nouvelle calamité du sement . . . ” at the back. Uncommon: WorldCat and NUC Pre-1956 locate only three U.S. libraries reporting ownership. For CATHOLICA specifically, click here. For HUMAN RIGHTS, click here.  First edition: Treatise on ancient dress among the Egyptians, Greeks, Persians, Jews, and Romans, among other peoples. The author, a Flemish artist also known as Andries Cornelis Lens, came to the study of antiquarian clothing by way of his classically inspired focus in painting. Illustrated with 51 copper-engraved plates done by Pitre Martenasie, this is an “Ouvrage estimé” according to Brunet (who seemingly mistakenly cites 57 engravings as opposed to the 51 given by von Lipperheide, described in institutional holdings, and present here). For more CLOTHING & FASHION, click here. For more ART REFERENCE, click here. For more GREEK & LATIN CLASSICS, click here. FIRST BIBLIOGRAPHY of AMERICANA (+) León Pinelo, Antonio de. Epítome de la bibliotheca oriental, y occidental, nautica, y geográfica ... Añadido y enmendado nuevamente en que se contienen los escritores de las Indias orientales, y occidentales, y reinos convecinos China, Tartaria, Japón, Persia, Armenia, Etiopía y otras partes. Madrid: En la oficina de Francisco Martinez Abad, 1737–38. Folio (30 cm; 11.75"). 3 vols. I: , ,  ff. II:  ff. III: 202 pp.  Antonio de León Pinelo (1589–1660) was a Spanish-colonial historian. Born in Cordova de Tucuman and educated at the Jesuit college of Lima, he left the New World for Spain in 1612 and there enjoyed a highly successful career, becoming attorney of the Council of the Indies and later a judge in the Casa de Contratacion in Seville. His Epitome was originally published in Madrid in 1629 and is here in the second edition as enlarged and annotated by Andres Gonzalez de Barcia: It was the first bibliography for the field of Americana and to this day it remains an important source for scholars and collectors of the colonial era of the New World for its wealth of bibliographic data and most especially information about manuscripts. Provenance: Ownership stamp of Carlos Sanz in several places. For CENTRAL AMERICANA, click here. For more of JAPANESE interest, click here. One Side (Entire) of an Enlightenment Debate Lessing, Gotthold Ephraim. Anti-Goeze ... D.i. Nothgedrungener beytraege zu den Freywilligen beytraegen des hrn. past. Goeze. Braunschweig: [Waisenhausbuchhandlung], 1778. Small 8vo (17.5 cm; 7"). 11 numbers in one volume, each 16 pp.  Lessing was one of the fathers of German Idealism during the Enlightenment and among other things is remembered for having provided “the foundation of a modern philosophy of religion” (Yasukata, Lessing's Philosophy of Religion and the German Enlightenment, p. 89). Johann Melchior Goeze (1717–86), a contemporary of Lessing, was a spiritual leader of the Lutheran Church in Germany and familiar with literature; he took up writing histories and apologetics and, because of their differing views on religion and ideals of the Enlightenment, he and Lessing entered into a debate. While the two are said to have remained cordial, the debate was so “bitter” that the Duke of Brunswick (Lessing's supporter) “intervened, silencing Lessing” (Oxford Companion to German Literature, 2nd ed., p. 554)! Printed here are Lessing's portions of the eleven exchanges in that debate. For BOOKS IN GERMAN, click here. To Talleyrand, on Behalf of the Insulted Catholic Church Lettre a M. Talleyrand, ancien evéque d'Autun, chef de la communion des Talleyrandistes, sur son rapport concernant l'admission égale & indéfinie de tous les cultes religieux. Paris: Chez les Marchands de Nouveautés, 1791. 8vo (21.8 cm, 8.6"). , 70 pp.  First edition, with errata on the title-page verso: This address to Charles Maurice de Talleyrand-Périgord was written in response to his report “Liberté des cultes religieux,” made to the Assemblée nationale constituante's Comité de constitution on May 7, 1791, regarding the Civil Constitution of the Clergy. There was also a Chez Dufresne printing later in the same year. Uncommon: WorldCat and NUC Pre-1956 locate only four U.S. institutional holdings of this first edition.  This ed. not in Martin & Walter (cf. IV 2: 8376). Sewn, never bound; title-page with affixed paper shelving label in lower inner corner, not touching text, and with pencilled monogram in upper outer corner. Page edges untrimmed and somewhat ragged; top edges mostly unopened; dust-soiling to outer leaves and untrimmed edges, with corners of a good many untriummed leaves turned in. A nice copy. (36785). The French Refugees Write Home Lettre des prêtres Catholiques déportés, adressée à leurs bienfaiteurs. . 8vo (20.3 cm, 8"). 16 pp.  Scarce pamphlet from the clergy in exile, addressed to N.T.C.F. (“nos très chers frères”) and counseling patience and faithfulness. Uncommon: WorldCat and NUC Pre-1956 locate only two U.S. institutional holdings. A Very Large University Broadside Printed on SILK Linares Montefrio y Martinez, Evaristo. Broadside. Begins, Excmo. domino ac semper domino meo, D. Josepho Moñino, comiti de Florida Blanca ... Exoptat hihi iam diu illuxit dies ... quo publicum oc non tantum mei in studiies, profectus, verum etiam grati animi significationes testimonium exhiberem. Toleti [i.e., Toledo]: apud Nicolaum de Almanzano, typographum universitatis, 1782. Folio (76 x 57 cm, 31" x 22.5" ). p.
 On 19 June 1782 at the Universidad de Toledo, Linares Montefrio stood to defend his Bachelor's degree and this letterpress broadside on rose-colored silk was the official announcement of that test. The oral examination centered on Justinian's Institutes, specifically book three, title 26. It is handsomely printed using several point sizes of roman and italic, with center justification in the top portion and full justification below. Around the printed area are wide margins on the four sides, which margins contain 16 large, crisp, evenly spaced impressions of the city of Toledo's double-headed eagle, with crown above, sword in its right talon and mace in its left. Boadsides were an important source of income for handpress-era printers in Europe and Spanish America and the printers offered “package deals” to the families of the graduate and post-graduate degree postulants; the packages were geared to the students' families' economic means. Broadsides could be large (folio) or small (8vo), have an engraving or not, have a border of type ornaments or not, and be printed on standard paper or colored paper (usually blue); if one splurged, one could get the announcement printed, as here, on silk. The usual total number of copies printed for each candidate is unknown at this time, but is likely to have been only one or two dozen, and we also don't know if more than one silk copy was printed when that top option was in fact ordered. In extravagant cases, one can imagine one for the degree candidate, one for the parents, one for each godparent, etc. ; still, such cases would probably have been few. Certainly, the printers would have been willing to rake in as much money as possible, on each happy occasion, and these richly beautiful silk mementos — doubtless proudly displayed for years going forward in homes or offices — would have been excellent ongoing advertisements. Equally clearly, however, the number of copies of all of the defense broadsides surviving is small, and the survival of those on silk is very small. No copies of this broadside are traced via the usual bibliographies, nor via NUC, WorldCat, COPAC, KVK, CCPB, or the OPACs of University of Toledo and the national library of Spain. For GREEK & LATIN CLASSICS, click here. For EUROPEAN LAW, click here. [Lloyd, Charles]. An examination of the principles and boasted disinterestedness of a late Right Honourable gentleman. In a letter from an old man of business, to a noble lord. 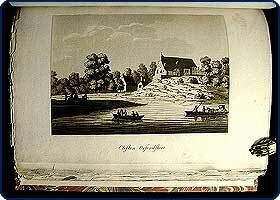 London: J. Almon, 1766. 8vo (20.5 cm, 8.1"). 34, [2 (adv.)] pp. [bound with] Short considerations vpon some late extraordinary grants. And other particvlars of a late patriot’s condvct. London: J. Almon, 1766. , 5–31, [3 (adv.)] pp.  Two examples of Pitt-related political criticism. An early hand has identified the title characters of the first piece as, respectively, Pitt, Temple, and North, although ESTC considers the “old man of business” to be Lloyd himself; the second piece, which is signed by “A Detester of Jobbs under all Administrations,” focuses entirely on Pitt’s recent creation as Earl of Chatham and his alleged abandonment of the cause of the common man. For ENGLISH POLITICS, click here. Locke's Personal Correspondence Locke, John. Some familiar letters between Mr. Locke, and several of his friends. London: A. & J. Churchill, 1708. 8vo (19 cm, 7.5"). , 540 pp.  First edition of the first official collection of Locke's letters: “Not only such civil and polite conversation as friendship produces among men of parts, learning and candour; but several matters relating to literature, and more particularly to Mr. Locke's notions, in his Essay concerning Human Understanding, and in some of his other works,” p. iii. Both sides of the exchanges are present, with correspondents including William Molyneux, Thomas Molyneux, Richard Burridge, and Philipp van Limborch; a number of letters are in Latin, and a few in French. For more LITERATURE, click here. TO Part IX . . .